DORCHESTER — It would be a shame if The Winter of Our Discontent caused many strong productions to go unnoticed or unappreciated. It’s hard enough to get people out to the theater in the dead of winter without Mother Nature piling on endlessly. So here’s hoping that the weather doesn’t waylay Fiddlehead Theatre’s warm, winning, family-friendly musical “The Wiz” at the Strand Theatre in Dorchester through Feb. 23. The alternative version of the classic musical “The Wizard of Oz” gives the iconic piece an urban-flavored makeover, with a snazzy, R&B and jazz-flavored score by Charlie Smalls, and characters that are a little funkier and edgier than those in the classic MGM movie or the original stage version. 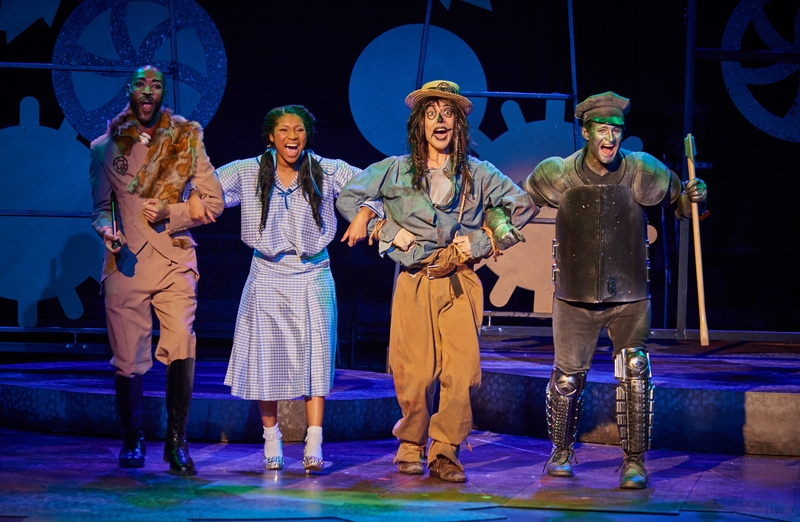 Berklee College student Holmes has a winning stage presence and strong vocal chops as Dorothy, the young Kansas girl swept up in a tornado who lands atop an evil witch in the magical world of Oz. Just as characters who appear in the Kansas segment of the original “The Wizard of Oz” will re-emerge later in Oz, Henry will re-appear as Evilene, the evil witch who Dorothy must vanquish before The Wizard will grant her request to return home. 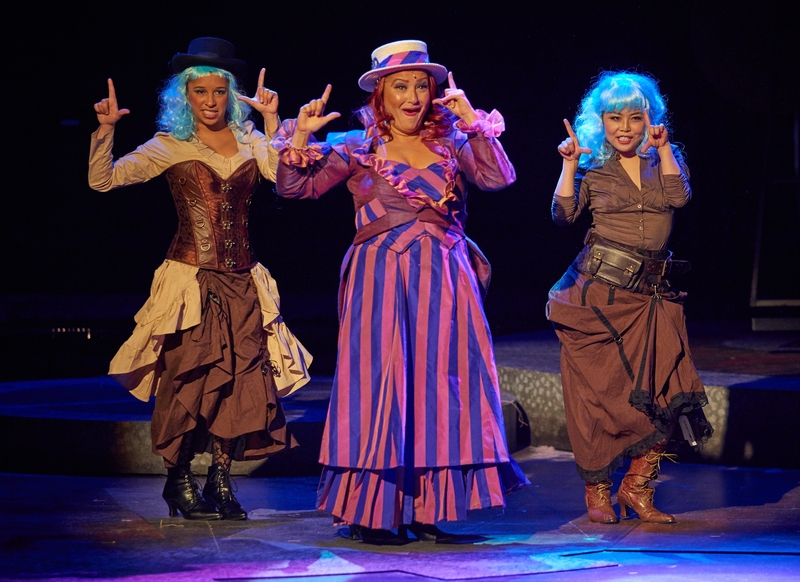 Henry as Evilene shines in the second act production number “No Bad News,” and appears again later as the Good Witch Glinda. Foster-James scores both as the Gatekeeper and The Wiz himself, a good-hearted con man who found fame, fortune and power when a storm blew his balloon into Oz. The energetic, versatile and talented ensemble backing the lead characters gets quite a workout, portraying Munchkins, parts of the Yellow Brick Road, crows, poppies, field mice, the citizens of Emerald City (green-tinted glasses provided), Winkies and Winged Monkeys. Shana Dirik adds another in a series of strong supporting roles as the good-hearted but addle-brained and magic-challenged Addaperle, the Good Witch of the North. The strength of “The Wiz” will come as no surprise to those who saw Fiddlehead’s Associate Producing Artistic Director Stephens and Producing Artistic Director Meg Fofonoff et al perform minor theatrical miracles in Fiddlehead’s days at the Norwood Theatre, or saw Stephens direct the Reagle Music Theatre production of “Into The Woods” starring Rachel Woods, still the best local production of that work I’ve seen. The devil in any large-scale musical is in the details, and Fiddlehead made the effort to bring in cairn terrier Dusty — trained by famed animal trainer William Berloni — to play Toto. There was no sign of the sound woes that have intermittently bugged past Fiddlehead productions at The Strand. Mark DeLuzio’s sound design had the vocals melding smoothly and skillfully with the orchestra led by Balint Varga. A pre-show announcement showed that the city of Boston and Fiddlehead have cemented their relationship with the Fiddlehead as the Strand’s resident company. Stephens and Fofonoff announced a 2015-16 season for Fiddlehead at the Strand that includes “West Side Story” next fall; Disney’s “A Little Mermaid” next December; “Rent” in February 2016; and “Showboat” in the spring of 2016.